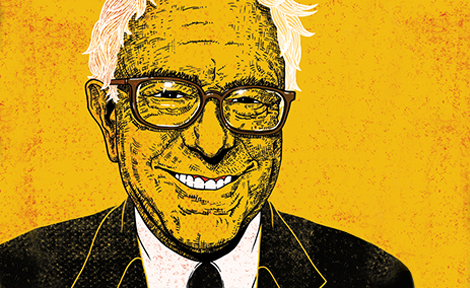 At the University in the 1960s, Bernie Sanders, AB'64, set out on a path that led to the Senate, and an unlikely place at the center. South Campus Residence Hall will be named for the late Renee Granville-Grossman, AB'63, whose $44 million bequest is the largest in University history. Political scientist and economist James Robinson joins Chicago Harris as a University Professor, the eighth active faculty member with the prestigious appointment. The Physical Sciences Division looks to the future. "I'm not pro sports gambling. I'm just a realist." NBA commissioner Adam Silver, JD'88, argues that "the best way for the league to monitor our integrity" is to make betting on games legal so it can be tracked. A study from UChicago's Urban Education Lab and Crime Lab reports "staggering" academic improvement from a tutoring and mentoring program. Geneticist Vincent Lynch sheds light on "the genetic changes that transformed egg-laying creatures ... into those that give birth to live young." Neurobiologist Peggy Mason, whose research has shown that rats feel empathy, says, "I'm perfectly happy thinking of myself as a rat with a fancy neocortex." Vice president for civic engagement Derek Douglas maps the strategy for removing barriers between the University and its surrounding neighborhoods. Privacy and Data Security: Is the US Business and Consumer Community Hacking It? On the Daily Show, Bill Browder, AB'85, once Russia's biggest foreign investor, discusses his fight for justice after the death of his jailed attorney. Plus, from our pages: "Reversal of fortune: How Bill Browder became one of the Kremlin's fiercest enemies." The death of poet Mark Strand inspires reflections on his work's enduring, personal impact.